If you have any questions or want to enquire about dates, use our form to contact Bernard Liaudois & Eric Dussiot or see their website for more information. Framed by a forested valley and mountainous horizons, this 17th-century château marries Provençal peace with deep comfort and style. Eric greets you in a courtyard whose manicured hedges and white roses dissolve into parkland: a panoramic pool, Japanese fish pond, an old tennis court… Under vaulted ceilings are more treats: a log fire, piano, candles, art, and Turkish cushions in the orangery where you may dine on iced melon soup and quail. Sprightly Eric pours and chats all the while. Immaculate rooms have space for families and the valley cries out for walking, riding and fishing in the Rhône. Dinner by arrangement with wine €35. Restaurants 3km. Singles €100-€255. Extra bed/sofabed available €30 per person per night. A beautiful house and a special place to stay. Very accommodating to our three young children who were made to feel very welcome and loved playing in the pool. Monsieur booked us a fantastic, reasonably priced local restaurant for dinner which we’d never have discovered on our own. The family room was well laid out with more than enough space for the five of us. We would love to return and definitely recommend. It is set high in a stunning position with magnificent views around the valley. Wonderful. Great fun stay with Bernard and Eric in their beautiful house and beautiful garden. The rooms are historic but very comfortable, the sunny outdoor breakfast was perfection, and they very kindly provided us with a delicious dinner too. A special place to stay. We were made very welcome and our delightful hosts laid on a spontaneous lovely evening meal after our long journey. What made it so special for us was eating with our hosts who were very interesting and stimulating company. The chateau is well situated, with a lovely courtyard and terrace in peaceful surroundings. The interior is rather grand in a rustic sort of way. We would happily stay there again. A truly delightful experience. 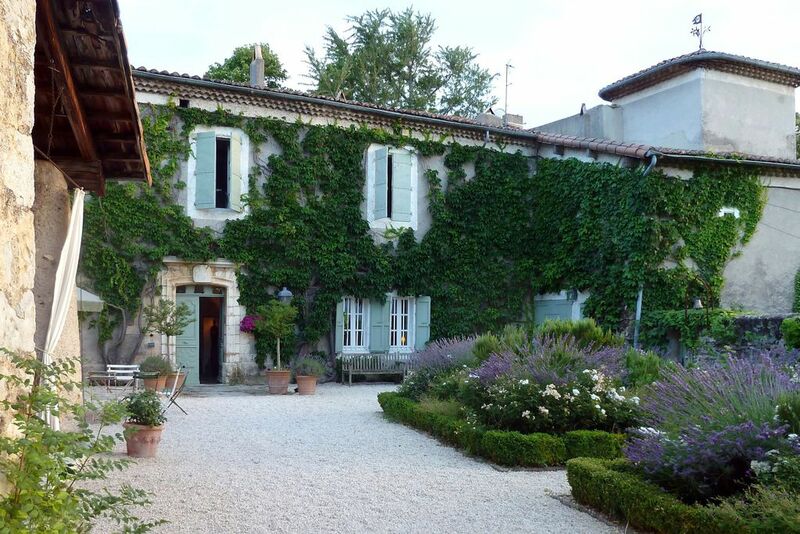 The owners create a very welcoming and open feel to this characterful and romantic chateau. It is brimming with treasures and artefacts from around the world and the walls adorned with colourful paintings by the host. The pool is a treat with fabulous views of the surrounding rolling countryside. Excellent restaurants nearby for supper and the hosts provide a delicious fresh breakfast. Eric is truly passionate about the chateau and is an excellent and engaging host. A wonderful spot close by to the Autoroute A7 between Orange and Lyon. Very welcoming and relaxed hosts, a beautifully decorated house whilst still retaining many original features. A large swimming pool. Dinner (when available) also highly recommended. An oasis of calm with great views over the surrounding countryside. All in all a great stay. Good country surrounding for walks, hikes, cycling, rock-climbing – river fishing – horse riding stables in the neighbourhood. Small provincial town with all trades, shopping, market : Privas (14 kms). Valence (36 kms) – Montelimar (21 kms). The Château overlooks the Chomerac valley and provides a quiet escape. NEW FOR 2019: Enquire about our themed weekends with courses, painting classes and meditation.